Other names: Bihis, kulammbug, palali. Katmon seems to be a native of the Philippines. This is found growing wild in forests at low and medium altitudes through out the country. 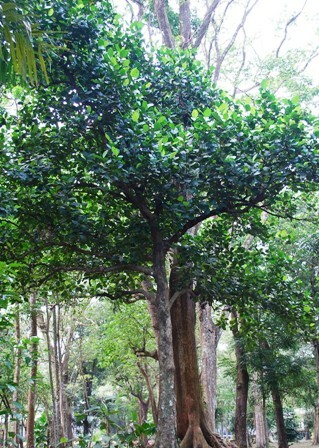 A medium sized evergreen tree 10-14 m high, bole erect to contorted with apparent buttressing, branching starts midway; bark smooth with shallow fissures. Leaves leathery, shining, ovate, elliptic or oblong-ovate, 12 to 25 centimeters long, and coarsely toothed at the margins. Flowers white, large, showy, about 13-16 cm wide. 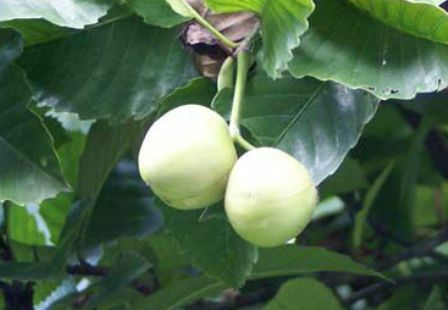 Fruit rounded, 5-6 cm in dia, edible, pulp fleshy, green. Katmon fruits are eaten and taste somewhat like green green sour apples. Fresh fruit is not particularly good but, owing to its acid, juicy character, it is refreshing when eaten in the woods. It makes an excellent sauce or jam and is also used for flavoring fish. A red dye is obtained from the bark of this tree. The sourish juice of katmon fruits, when mixed with sugar, is used as a cough cure. It is also employed for cleaning the hair. 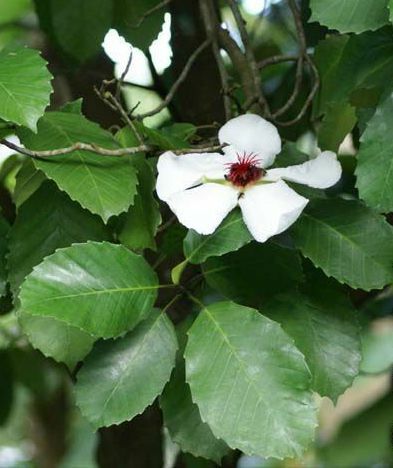 Katmon is quite sensitive to cold and should not be planted at locations where the minimum temperature can reach 10 C. The tree seem to require locations which recive enough sunlight. New trees can be raised from seed.